For dinner, sometimes just an easy plate of fruits, veggies and cheese or nuts hits the spot. (Low FODMAPs: few or no peas and apples, just a small handful of peanuts). My kids had this, popcorn, and corn chips with cheddar cheese. To make it all low FODMAPs, replace the peas and apples with cantaloupe, blueberries, etc.. A tahini dipping sauce might be nice, too! 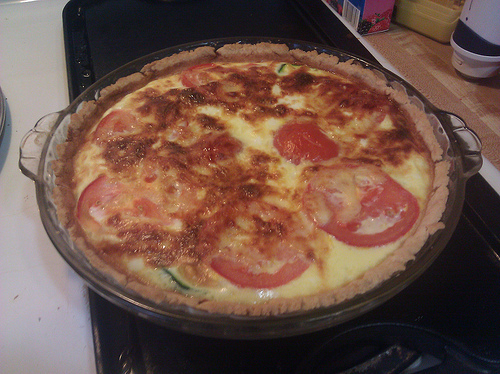 I made a GF pie crust and filled it with zucchini, tomato, and cheddar cheese, then poured a mixture of 3 eggs and 1 cup of lactose-free milk for a lovely quiche. I’m also really enjoying Schar white bread. It’s GF, low FODMAPs (a lot of GF breads are not — they have milk, apple fiber, or are sweetened with pear or apple juice) and has a subtle sourdough flavor! I’ve eaten it toasted with maple butter for breakfast. I also have a grown up cheese toast by covering it with a slice of tomato, Gruyere cheese and some fresh thyme. The kids and I went to the farm and picked three pounds of strawberries. 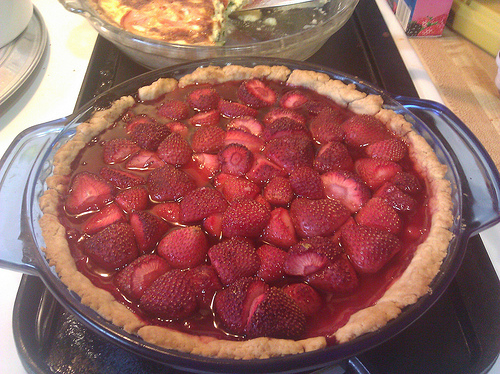 Not enough to make jam, but plenty for snacking and a pie!